bNeurosurgery (K.R. ), University of Erlangen-Nuremberg, Erlangen, Germany. BACKGROUND AND PURPOSE: Endovascular flow diverters are increasingly used for the treatment of cerebral aneurysms. We assessed the safety and efficacy of the Flow-Redirection Endoluminal Device (FRED) in a consecutive series of 50 patients. MATERIALS AND METHODS: Inclusion criteria were wide-neck, blister-like, or fusiform/dissecting aneurysms independent of size, treated with the FRED between February 2014 and May 2015. Assessment criteria were aneurysm occlusion, manifest ischemic stroke, bleeding, or death. The occlusion rate was assessed at 3 months with flat panel CT and at 6 months with DSA by using the Raymond classification and the O'Kelly-Marotta grading scale. RESULTS: Fifty patients with 52 aneurysms were treated with 54 FREDs; 20 patients were treated with the FRED and coils. 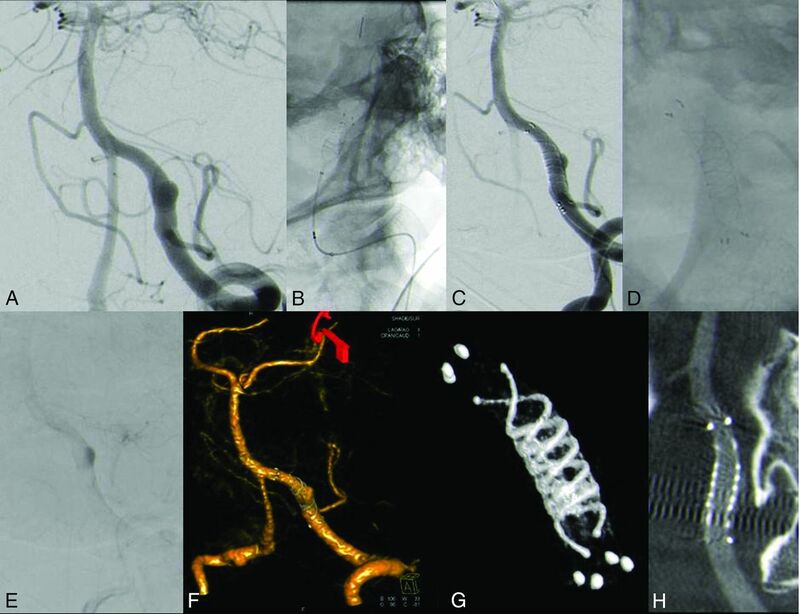 Aneurysm size ranged from 2.0 to 18.5 mm. Deployment of the FRED was successful in all cases. There were no device-associated complications. One patient developed mild stroke symptoms that fully receded within days. There have been no late-term complications so far and no treatment-related mortality. Initial follow-up at 3 months showed complete occlusion in 72.3% of the overall study group, Six-month follow-up showed total and remnant-neck occlusion in 87.2% of patients, distributed over 81.5% of the FRED-only cases and 95.0% of the cases with combined treatment. CONCLUSIONS: The FRED flow diverter is a safe device for the treatment of cerebral aneurysms of various types. Our data reveal high occlusion rates at 3 and 6 months, comparable with those in other flow diverters. Long-term occlusion rates are expected. Flow diverters can cause intra-aneurysmal thrombosis and thus occlusion.8⇓⇓⇓⇓⇓⇓⇓⇓⇓⇓–19 This outcome is achieved by a narrowly braided stent wall, which, on the other hand, allows the blood to pass through to perforator arteries or major branches where the pressure gradient is high enough. We report our results for safety and efficacy in a consecutive series of 50 patients treated with the FRED flow diverter with incidental cerebral aneurysms or those who were retreated after initial coiling in SAH. The inclusion period was from February 2014 through May 2015. All patients treated with a FRED flow diverter for ≥1 aneurysm were included. In the otherwise consecutive series, only 2 patients were excluded, being treated for carotid-cavernous fistulas with 2 FREDs each (stent-in-stent). The FRED was not used exclusively during this period but as an alternative to other flow diverters when it seemed appropriate. The decision about whether to perform open surgery or intravascular therapy is made in a clinical conference with a neurosurgeon and neurologist. Accessibility and form (especially the neck and the neck/dome visual ratio) of the aneurysm, age, clinical condition, and the patient's wishes influence the decision. The selection of the particular device and the choice of whether to use additional coils are made by 2 senior neuroradiologists. In general, in our department flow diverters are used for all blister-like aneurysms or those with a wide neck where coil dislocation is expected or where a proper reconstruction of the base seems unlikely with a balloon only, leading to an assumed higher risk of reperfusion. Although there is no sharp cutoff in aneurysm size for additional coiling, we attempt to use coils in aneurysms of >5 mm when safe catheterization is possible. If so, there is an attempt at dense packing to reduce the rate of reperfusion21 and post-flow-diverting hemorrhage.22 In the aneurysms treated in this cohort with a flow diverter and coils, the flow diverter was necessary for remodeling the aneurysm base. Solitary coil embolization was not a proper option in those cases. The FRED is preferred compared with other flow diverters if major branches are in the vicinity (eg, the anterior choroid artery) because one can achieve proper coverage of the aneurysm neck combined with stable positioning while the major branch is only covered by the open-pored part of the flow diverter. In patients with acute SAH, flow diversion was used only when there was no other intravascular or surgical option available. Administration of aspirin and clopidogrel hours before placement of the stent has not seemed appropriate to us in light of a possible re-SAH, though new regimens with short loading intervals using adjunctive tirofiban have a low complication profile.23 Furthermore, platelet suppression might severely affect further surgical options such as placing a CSF drain. Both diagnostic angiography and intervention were performed by using an Axiom Artis dBA biplane system (Siemens, Erlangen, Germany). All patients underwent diagnostic angiography before the intervention for planning of endovascular therapy. For each patient, 3D imaging of the aneurysm (with multiplane and volume rendering technique reconstructions) was acquired combined with targeted series, depicting the aneurysm neck and parent vessel. Before the intervention, all patients provided informed consent for the procedure. Forty-eight patients were prepared with 75 mg of clopidogrel and 100 mg of aspirin 7 days before the intervention. Of the 2 other patients, one was pretreated with 500 mg of ticlopidine, and one, with 150 mg of clopidogrel due to aspirin intolerance. Sufficient platelet suppression was observed by using a Multiplate analyzer (Roche, Basel, Switzerland) 1 day before the intervention. The Multiplate analyzer indicates proper response to aspirin and clopidogrel/ticlopidine when ASPItest and ADPtest values are beneath standard range. Because there were no nonresponders in our study group for either of the drugs, no action was taken. Standard transfemoral access was obtained by using an 80-/90-cm 6F sheath placed in the common carotid artery or a 65-cm 6F sheath placed in the subclavian artery, respectively. We placed 6F Envoy guiding catheters (Codman & Shurtleff, Raynham, Massachusetts) with or without a soft tip (distal access type) in the C1 section of the internal carotid artery or the proximal V3 segment of the vertebral artery, as appropriate. At the start of the intervention, standard posterior-anterior and lateral series were acquired for later comparison. Coil positioning and deployment of the flow diverter were surveilled under road-mapping/fluoroscopy. After the procedure, posterior-anterior and lateral series of the vascular territory were acquired to rule out distal embolisms. Hemorrhage was ruled out by flat panel CT (FPCT, Dyna CT; Siemens) following the intervention. FRED is approved in Europe and several other countries. There is no FDA approval so far. The FRED is available from 3.5 to 5.5 mm in diameter, in increments of 0.5 mm and from 13/7 to 32/25 mm in length: The first number gives the total length, and the second number denotes the working (flow-diverting) length. It is delivered via a 2-tip microcatheter (Headway 27 microcatheter; MicroVention; distal: 2.6F/proximal: 3.1F). The FRED size was based on the diameter of the parent vessel or slightly overdimensioned. An example case is given in Fig 1 illustrating shape and visualization of the FRED. Sidewall aneurysm of the left vertebral artery (A). Gradual deployment of the FRED device (B and C). Note delayed washout of contrast right after deployment (E) and good visualization of the flow diverter on 2D and 3D imaging (D, F–H) (3D imaging acquired with flat panel CT). D and G, The overall (4 markers at each end) and working length (radiopaque “double helix”) are illustrated. For additional coiling bioactive (Cerecyte coils; Codman & Shurtleff) or Hydrogel coils (MicroVention) were used according to the aneurysm size. The microcatheter was placed in the aneurysm before deployment of the FRED (“jailing”). Follow-up imaging included MR imaging with TOF MRA and contrast-enhanced MRA and flat panel CT24 with intravenous contrast application during the hospital stay and at 3 months after the intervention; DSA, MR imaging, and FPCT were performed 6 months after the intervention. Clopidogrel was stopped 3 months after the intervention if no pathologic findings occurred. Patients were examined by a neurologist for neurologic deficits at admission, after the intervention, and at discharge. Assessment criteria were the following: manifest ischemic stroke, flow diverter–associated hemorrhage, or death. Procedural safety (deployment, visibility) was assessed by 2 experienced interventionists. Occlusion rates were assessed by 2 interventionists in a consensus reading. The O'Kelly-Marotta grading scale25 for flow diversion (A, total filling; B, subtotal filling; C, entry remnant; D, no filling; 1, immediate washout; 2, stasis until the capillary phase; 3, stasis until the venous phase) was used in time-resolved DSA imaging immediately and 6 months after the intervention. The Raymond-Roy occlusion classification (RROC; 1, complete occlusion; 2, remnant neck/dog ear; 3, remnant aneurysm) was used in steady-state angiography (FPCT, MRA) during the hospital stay and at 3 and 6 months. Fifty patients (39 women, 11 men; 55.4 ± 11.9 years of age; range, 25–77 years) with 52 aneurysms were treated. In our series, we used FRED implant sizes from 3.5 × 13/7 mm to 5.5 × 32/25 mm. Forty-four (88%) aneurysms were located at the ICA and carotid bifurcation, including the posterior communicating artery origin (2 patients had 2 aneurysms in the same segment covered with 1 flow diverter); 1 (2%), at the MCA; 3 (6%), at the intracranial part of the vertebral artery; and 1 each, at the PICA origin and basilar tip. Forty-two aneurysms (84%) were incidental findings. Fourteen patients (28%) were retreated with the FRED for recurrence of a previously coiled aneurysm. Four of the retreated patients had an SAH from the targeted aneurysm before the first treatment. Prior treatment included stent placement (n = 2), stent-protected coiling (n = 2), implantation of a different flow diverter (n = 2), prior clipping (n = 1), flow-diverter-protected coiling (n = 1), and prior coiling (n = 6). Another 4 (8%) patients had SAH originating from another aneurysm. Thirty (60%) patients were treated exclusively with a FRED device (group A) in the current intervention. In 4 patients (8%), 2 overlapping flow diverters (stent-in-stent) were used because no safe catheterization of the aneurysm was possible (n = 2) or the aneurysm was at the origin of the ophthalmic artery (n = 2). The former showed no relevant stasis of contrast after deployment of the first FRED and they were thus treated with a second flow diverter. The latter was thought unlikely to occlude because a high-pressure gradient from the ophthalmic artery was present. Twenty (40%) patients underwent additional coiling (group B), as explained in the “Materials and Methods” section. Aneurysm sizes ranged from 2.0 to 18.5 mm, resulting in a mean diameter of 5.4 ± 4.5 mm in the overall group. Aneurysm sizes ranged from 2.0 to 13.0 mm (mean, 3.6 ± 2.7 mm) in group A and from 2.5 to 18.5 mm (mean, 8.0 ± 5.2 mm) in group B. Thirty-nine saccular, 8 blister-like, and 3 fusiform/dissecting aneurysms were treated, with mean sizes of 5.8 ± 4.6 mm (range, 1.5–18.5 mm), 2.1 ± 0.6 mm (range, 1.5–3 mm), and 8.3 ± 3.3 mm (range, 5.5–13 mm), respectively. Thirty-nine patients (78%) had neither clinical complications nor pathologic imaging findings. Nine patients (18%) showed punctual subcortical ischemic lesions on postprocedural MR imaging without neurologic deficits. One patient had mild contralateral hemiparesis right after the intervention but recovered completely during the hospital stay. In 1 patient in group B treated with additional bioactive coils, the early MR imaging showed several punctual contrast-enhancing lesions on the ipsilateral hemisphere; this patient had moderate temporary headache but no focal deficits. Hence, no intervention-related mortality was observed. In 1 patient with a primarily successful deployment and complete wall adaptation of the FRED, there was a shift in configuration on initial follow-up, showing a concentric narrowing of the distal end with 2 of 4 markers sticking together (“fish mouth” configuration), resulting in a mild delay of time-to-peak and mean transit time on perfusion-weighted imaging. This finding remained stable at 3 months but showed complete resolution at the routine DSA follow-up at 6 months. At 6-month follow-up, we found endothelial hyperplasia without hemodynamic effects in MR perfusion in 1 patient and concentric narrowing of the flow diverter and parent vessel in 2 patients, one of whom had delayed time-to-peak perfusion on MR imaging. As a consequence, patients with fish-mouthing or endothelial hyperplasia received extended dual platelet inhibition until 6 months after the intervention. In an additional follow-up with FPCT 3 months later, the findings remained stable and clopidogrel was stopped again. Immediate complete occlusion occurred in group B in 9 patients (18%); there was no case of immediate complete occlusion in group A. Detailed immediate postinterventional occlusion rates are given in Table 1. Three-month FPCT and MR imaging were available in 47 cases. One FPCT dataset was not evaluable because of hardening artifacts from the coil package; therefore, only MR imaging was used for occlusion rate assessment.26,27 Three patients were lost to follow-up: One patient died of a heart attack in the meantime; in 2 patients, the 3-month follow-up was not performed because they refused to undergo further imaging. In the overall group, we observed complete aneurysm occlusion in 34 of 47 patients (72.3%). Another 8 patients (17.0%) showed functional occlusion with only a remaining “dog ear,” resulting in 89.3% complete or subtotal occlusion. Occlusion rates after 3 months in the particular treatment groups are given in Table 2. Reperfusion occurred in 2 patients (4%) in group B (aneurysm sizes, 18 and 18.5 mm) who changed from RROC grade 1 in the postprocedural scan to RROC grade 2 at the 3-month follow-up, remaining unchanged after 6 months. Six-month DSA follow-up (particular occlusion rates given in Table 3) was available in 43 patients. In addition to the 1 patient who died in the first 3-month period, 6 patients (12%) refused to have another diagnostic angiography because of anxiety or unknown reasons. For those patients, MR imaging (n = 3) or FPCT (patient = 1) was available in 4 as an alternative imaging method. The results of all patients, including DSA and FPCT or MRA, are shown in Table 4 with RROC because there was no dynamic information available throughout the overall group. The additional patient with RROC grade 3 in group B did not have a recurrence but did not undergo follow-up at 3 months for medical reasons (severe impairment after SAH with prolonged rehabilitation) and thus was not considered in Table 3. Occlusion rates for the different subtypes of aneurysms are given in Table 5. Adding RROC 1 and 2 results, we achieved an occlusion rate of 81.5% in group A, 95.0% in group B, and 87.2 % in the overall study group. In this single-center prospective study, we examined the FRED flow diverter, a device designed to combine easy deployment with flow-diversion properties and a safety profile similar to that of other flow diverters on the market. Six-month follow-up revealed an overall complete occlusion rate of 76.6%, with a recognizable lower rate of 74.1% in group A (FRED exclusively) than the group B (FRED and coils) rate of 80.0%. Given that most aneurysms were incidental findings in which a small remnant neck might be acceptable, there was subtotal occlusion (complete occlusion or small remnant neck) of 87.2% in the overall group (81.5% group A, 95.0% group B). The occlusion rates were stable during the time observed in all except 2 patients in group B in whom large aneurysms of 18.0 and 18.5 mm showed reperfusion after 3 months. Four patients (8%) were treated with 2 flow diverters as stent-in-stent over the same aneurysm, 2 of whom had an aneurysm of ophthalmic artery origin. In the latter, considerable shrinkage could be achieved (Fig 2). Shrinking aneurysms at the origin of smaller arteries where a relevant blood pressure gradient is present are described for the PED as well.29 In the other 2 patients, there was complete occlusion of the aneurysm at 6 months after treatment with 2 FREDs. Paraophthalmic aneurysm 6 months after (A) and before (B) implantation of 2 FREDs. Note the “white collar” between the parent vessel and the aneurysm, suggesting endothelialization of the stents. Only low occlusion rates (1/6 complete occlusions, another 3/6 remnant necks) were achieved in aneurysms of >10 mm. Because this study included a very small number of patients and rather short follow-up, our results are probably insufficient for reliable assessment of the efficacy in large aneurysms. On the other hand, we could achieve a reduction in size and thus mass effect in two-thirds of large aneurysms. We also expect advancing occlusion of the larger aneurysms during further follow-up. The FRED flow diverter is a technically safe device with a low rate of complications. It has occlusion rates similar to those of other flow diverters. It is our experience that its higher radial force allows easier deployment in certain cases. Long-term follow-up is needed to prove stable occlusion, especially in larger aneurysms and those with no additional coiling. Accepted after revision October 23, 2016.